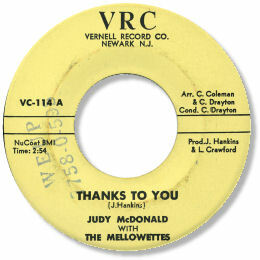 Backing group the Mellowettes (of whom Judy may well have been the lead voice) have some visibility in soul circles because of their “I’m Tired (Of Being Second Choice)” release. But this track Thanks To You is a much better one. Despite the engagingly amateur production and the out of tune horns Judy’s voice rises thrillingly above it all, harmonising well with her backing singers, giving a totally convincing performance, leant even more credibility by the occasional gritty phrase. She fits perfectly in with a tempo that may just be the slowest ever recorded for a deep soul disc. The re-release different version doesn't have the impact of the orignial at all. There are other 45s to watch out for on the tiny New Jersey based VRC label, notably the fine one by Little Willie Jones. Help me solve this problem / ? ~ VRC ? Note: "Help me solve this problem" is the same song as the orginal "Thanks to you". But there are small differences between the two versions of "Thanks To You" - the later one has the background Mellowettes toned down. I much prefer the cut on this page. Thanks to Soldiegirl for extra info.